Courtesy of Ken Reid’s Tumblr page. Q: In 2003, you decided to try your hand at stand-up. What was the impetuous behind that decision? A: I had been in bands from 1996-1999 or so, I am in no way shape or form a musician, but always wanted to perform. Once the band broke up and I had no musicians to ride the coattails of I thought stand up was my only route. I always liked comedy and watched tons of stand up, so i gave it a go. Q: How many stand-up engagements do you perform in a year? A: I average about 2 a week so 100-150 a year is probably about the normal. Q: Do you have any engagements coming up? If yes, where and when? 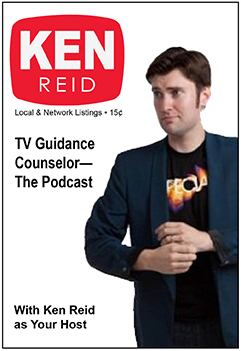 Q: When did the idea for your podcast, TV Guidance Counselor, come about? A: Friend and fellow comic Sean Sullivan basically told me that I have all these TV Guides, when people come over my house we often will flip through them and discuss old shows, why not just do that as a podcast? I wanted to do a podcast for a long time but didn’t have a great idea that would be different from the usual two comics just chatting format, until Sean threw that at me. I also do almost no pop culture stuff in my stand up, despite that occupying a huge part of my brain, so it was a great excuse to exercise a lot of that stuff. Q: When did you start collecting TV Guides? A: As early as I can remember. There are photos of me at age 2 with a TV Guide in my hand. Q: What issue made you want to collect TV Guides? A: Not sure if it’s a specific issue really . I like having the little digest sized time machine on hand. Q: Are you still collecting? A: Not new issues, but if I see some old ones I don’t have, I grab them. Q: What were some of your favorite shows growing up? A: Just the Ten of Us is a lifelong favorite, Newhart, Parker Lewis Can’t Lose, The Adventures of Pete and Pete. The Facts of Life. Weirdly I’ve been lucky enough to have people who’ve been on all those shows guest on my podcast. Q: What are some of your favorite shows now? A: Weirdly I don’t watch too much new stuff. I like The Flash, and I still watch Supernatural. Fringe was the only show I watched weekly as it came out and LOVED in the last few years. I think it is the best sci-fi show of all time. Q: Who are some of the people you would like to have on your podcast? A: I do have some dream guests. Paul “Pee Wee Herman” Reubens, Cassanda “Elvira” Peterson, John Larroquette, John Waters. Q: You will be at Super Megafest in November and the Pop Culture Expo in December, are these the first conventions you have been a guest at? A: Weirdly no. Gary at North East Comic Con has had me do live TV Guidance Counselors at the last few. I always have a good time. Last year, I did the stand up show at Super Megafest, which was also fun. Q: What drew you to being a guest at a convention? A: They asked, and I’m almost always there anyway, so it’s a win-win. Q: Are there any comedians you looked up to growing up? A: Dana Gould was my absolute #1 for sure. I was also always a huge Bob Newhart fan. Q: Who are some comedians today that you would suggest people go see? A: Hmm….I’d still go with Dana Gould. Q: Do you have any advice for anyone who wants to become a comedian? A: Don’t do it! But if you must be prepared to be terrible for at least two years even if you think you are. Don’t do it with a goal in mind, just do it to enjoy doing it and you’ll be fine. If you are free this weekend, go to Super Megafest to hear Ken and to meet a lot of celebrities. Find out more information here.